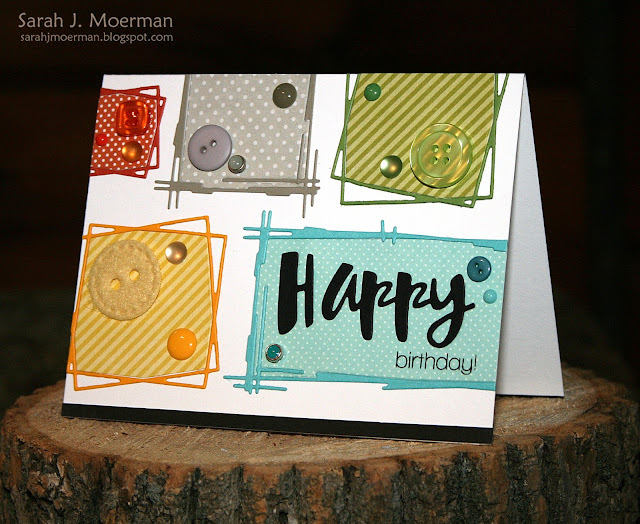 I started with Simon's Sketch Frame Die and Quadrangle Frames Dies to create my blocks using solid colored cardstocks. I then die cut matching patterned papers and pieced everything together. The "Happy" was cut from Simon's Black Cardstock using their Happy Birthday Die and "birthday" was stamped using a greeting from Simon's Happy Clear Stamps. I added a strip of the black cardstock to the bottom of the card to help ground it and finished things off with a variety of embellishments. That's it for my today! Hope you have a great day! how modern and interesting. enjoy the look of the round buttons in the squared boxes. impressive card! love the boxes and buttons. Frames and colors make me happy! Great card. Very cute! I'm just getting back into card making after taking a couple of years off- very inspiring. I love seeing all the new Simon products too.